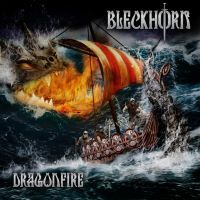 When I first turned on “Dragonfire”, the title track and opening single of BLECKHORN’s EP, I jammed. It was everything a Viking Metal song should be: anthemic, powerful, the riffs drove and hammered, and the vocals about sailing on from Valhalla to adventure were operatic and majestically fueled. No surprise that this is a supergroup founded by the bassist from HAMMERFALL, Magnus Rosen, and featuring ex-Yngvie Malmsteen vocalist Goran Edman, and renowned producer and guitarist Jayce Landberg - who worked with the likes of John Levin and Mark Boals of EUROPE and RING OF FIRE, respectively. The sound is excellent, the guitars sing, and everything instrumentally sounds wonderful. However, I have one caveat. For such a powerful, influential supergroup, they don’t stray to far from conventions or add anything new to the genre. While the EP is powerful, solid, and features great elements of Viking Metal, it plays it too safe for the talented people behind it. The intro to “Gates of Valhalla” makes a slight exception with a techno/electronic start. It made me wonder if Electronica was invading Metal as it has consumed Pop, Rap and Country over the last decade; especially since WITHIN TEMPTATION’s new release from this year, “Resist”, is Electronica-heavy as well. Nevertheless, it’s a solid opener, especially when the guitars kick in. The outro was a little long for my taste (confession: I’m probably one of those rare Power Metal fans who is not a fan of long solos - especially if it becomes monotonous and repetitive). “Land of Glory” gave me a KAMELOT vibe as soon as Goran Edman started to sing; especially coupled with the strong marching vibe of the chorus. Of the songs on the EP, this one was my favorite. The transition from the softer, melodic verses to the anthemic chorus had me hooked form beginning to end. “Ragnarok”, a near-obligatory song title in every Viking Metal band’s roster, felt pedantic in the verses, but the powerful chorus and lyrical refrain therein saved the song for me. The guitar licks in the music break were also a nice touch, adding some good, soaring elements to the song. To summarize, while this is a solid, enjoyable EP, knowing who’s behind it, they could have pushed further. I think if they expanded this EP into a concept album, maybe experimented with some new styles and solidified the theme, it could’ve be a pioneering masterpiece for the genre itself. As is, it could be a great introduction to Power Metal for new fans; and I hope their single gets a US release.